This hand-poured soy wax candle lets you celebrate your anniversary with candlelight and bubbly anytime. Celebrate your anniversary with candlelight and a bit of the bubbly—anytime. 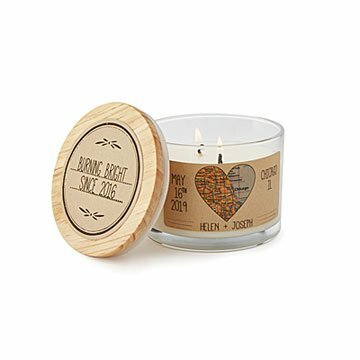 Just the right size to display on your coffee table, or anywhere you want to show a little love, this hand-poured soy wax candle is a sweet way to commemorate the day you made it official. Personalized with your names, the date of choice, and a map of a special city (where you met or got married, for example), this champagne-scented accent contains two wicks. (Yes, that is symbolism. Yep, we agree it's adorable.) Give one to your partner to show that your love still burns bright, or to a happy couple on their wedding day or anniversary. Handmade in Oregon. My partner loved the candle today. Can't wait to light it tonight. Prominently displayed, all who see it congratulate me on finding such a unique gift. I bought this for my boyfriend for our four year anniversary. We both love it! The thought behind it, thescent, the design, it's all great!